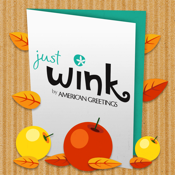 justWink lets you personalize and send awesome greeting cards from your phone to your friends, family, and beyond, via REAL MAIL, TXT Messages, Email, Twitter, Facebook or Apple Watch! Always have the perfect card at your fingertips—over 200 cards that will work for every who, what, where, and when in your crazy life! Cards that shuffle between, funny, bold, cute, trendy, sassy, heartfelt, sweet, and beautiful. The justWink Greeting Cards app provides you with countless ways to share your feelings, say thank you, and send your family and friends well wishes on any occasion.